1431: the eight-month-old son of Henry V and Katherine of Valois becomes King Henry VI of England. Facts being that infants did not typically make very productive kings, Parliament appointed Humphrey, Duke of Gloucester as Protector and Defender of the Realm and the Church. Once Henry was of age he was crowned King of England at Westminster Abbey and King of France two years later in Notre Dame (although he didn't have free "reign" there until 5 years later). Henry VI was a very unpopular king. His marriage to Margaret of Anjou brought about the nasty Treaty of Tours where England lost Maine and Anjou to the French. The crown's finances were in the loo and corruption was a spreading cancer at court. Not only was he a poor king, but he was also a bit crazy. 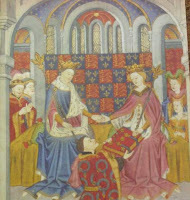 Henry's first mental episode started with having a breakdown in 1453 after hearing of the English defeat in Aquitaine. His illness was more than likely passed down from his grandfather, Charles VI of France and can be traced back a few generations. While Henry was in the throes of madness and the throne was as unstable as he, the War of the Roses began with York and Lancaster fighting over the crown. The Royals fled to Scotland. In 1470 the Yorkists were defeated and Henry VI was put back on the throne. This proved to be a short change of venue as he was soon imprisoned in the Tower of London where he had the unfortunate luck to be murdered. Some say it was Richard, Duke of Gloucester (later King Richard III), who was also accused with murdering Henry's son Edward. You can now find Henry safely intombed in Windsor Castle, if you should fancy a meeting. Love this post, Amy! Had me laughing!